shades of purple with some white and gray 1.5-inch size. Coverage is approximately 110 to 120 square feet at a 2-inch thickness per ton. pink and black gravel 1-inch size. Coverage is approximately 110 to 120 square feet at a 2-inch thickness per ton. orange to brown gravel ¾-inch size. Coverage is approximately 110 to 120 square feet at a 2-inch thickness per ton. Meramec C is a decorative gravel with multiple uses in and around your home. Meramec C is used for diverse purposes such as mulch, ground cover, driveways and filler around pools and patios. Average Size: 3/4″ – 1″ Color: Brown & tan river pebble, naturally rounded. multi-colored gravel 2-6-inch size. Coverage is approximately 50 square feet per ton. 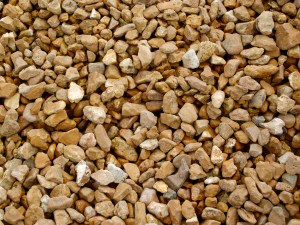 lightweight gravel in brown with tan and gray color 1-inch size. Coverage is approximately 210 to 220 square feet at a 2-inch thickness per ton. multi-colored gravel that comes in either a ½ to ¾-inch or 1.5-inch size. Coverage is approximately 110 to 120 square feet at a 2-inch thickness per ton. gray, purple, and black gravel that comes in either a ¾-inch or 1.5-inch size. Coverage is approximately 110 to 120 square feet at a 2-inch thickness per ton. Trap Rock is an angular stone that can be used for practical purposes, like drainage and driveways. Due to its color, trap rock is the perfect gravel to complement a water feature like a small stream.